During July, Jewel-Osco is relaunching its at-register fundraising campaign through the “Making Change” donation program called “Change for Champions” to support the athletes of Special Olympics Illinois. The program runs July 1-31 at 184 Jewel-Osco locations throughout Illinois and customers will be encouraged to make a $1, $3 or $5 donation when they check out. 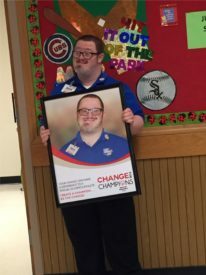 This year’s “Change for Champions” campaign features Stephen Katz, a Special Olympics Illinois athlete and employee of Jewel-Osco. In 2016, Stephen celebrates 10 years working with Jewel-Osco at the Northpoint Shopping Center store in Arlington Heights. Stephen has been competing with Special Olympics since he was 8 years old and has won numerous medals. Most recently, Stephen won three gold medals in powerlifting but he also competes in gymnastics, basketball, track, volleyball, swimming and softball. In addition to the Change for Champions campaign, Jewel is the Presenting Sponsor for the 11th Annual Windy City Rubber Ducky Derby again this year. Over the last 10 years, the event has raised money and awareness for Special Olympics Illinois and become a favorite Chicago summertime event. They were also a Bronze Sponsor for this year’s Summer Games in Normal. Nearly 4,000 athletes competed over three days in athletics, aquatics, gymnastics, powerlifting, soccer and bocce.